From Fire-Toolz’s two 2017 releases (Drip Mental and Interbeing), it’s clear that no one was making music quite like Angel Marcloid. Her aggressive amalgamation of electronic collages, massive drones and shrill screams is unlike most others, but there’s an undeniable giddiness in the anthemic chord progressions and frenetic breakbeats. Her newest release, Skinless X-1, is only an improvement on those recordings. The music here reaches new levels of cohesion, ultimately crafting Marcloid’s most powerful statement yet. After a brief intro track, Marcloid delivers a series of short, vibrant cuts. Synthesizers grinding like jackhammers grace nearly every track, and compositions like “✓ iNTERBEiNG” and “Screamography” feature some of her most memorable melodies to date. 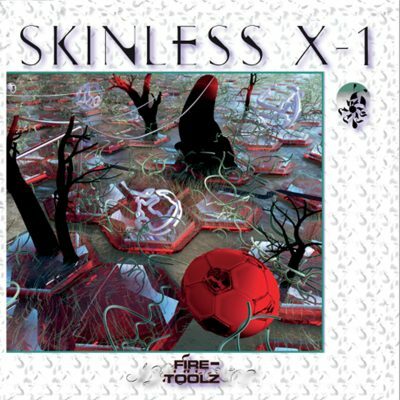 Skinless X-1 is the first Fire-Toolz release to be pressed on vinyl and Marcloid draws on the classic rock tradition of placing the more succinct, fiery compositions toward the front, so that the opening 20 minutes are a breakneck ride through the wildest music this record has to offer. After this string of gleeful gems, Marcloid stretches out her compositions for a more expansive second side. “μακάρων νῆσοι「Fortunate Isles」” and “Ἠλύσιον πεδίον 「Elysian Fields」” are the closest she gets to delivering calming music, and the effect within the tumultuous album is welcome. The way the rhythm constantly upends itself on the former track keeps the music from ever fully resting—as does the slowly thickening texture of rapid percussion and synthesizers. Following these tracks, “Λήθη「Lethe 」” is the violent climax that brings all of the chaos together. Nowhere else on the album is the music this abrasive, the drum programming this driving and the noise this totalizing. The final climax, which obliterates the music into a formless arsenal of static and synthetic instrumentation, is a moment of great significance. On a record so concerned with deconstruction, resignification and transformation, this wall of purely spatial music feels like the naked answer to the confounding questions that Skinless X-1 has been asking. Even if you can’t make out Marcloid’s lyrics under her screams, there’s a wealth of conceptual nuance and emotional expression built into Skinless X-1’s music. “Second Life,” with its glitchy samples and stock computer sounds, is an obvious reference to the surreal escapism of the titular online world. Later in the track, though, a spoken-word passage about reincarnation adds another meaning to the title. Is an online persona a true means of escaping the human body? Marcloid’s use of emoji and other internet-speak feels like a non-ironic answer to this question. Where her peers would sarcastically co-opt these linguistics to make a criticism, tracks like the blissfully reminiscent “In the Computer Room @ Dusk ☕” offer a sincere ode to the way these technologies have shaped the personalities of people Marcloid’s age.